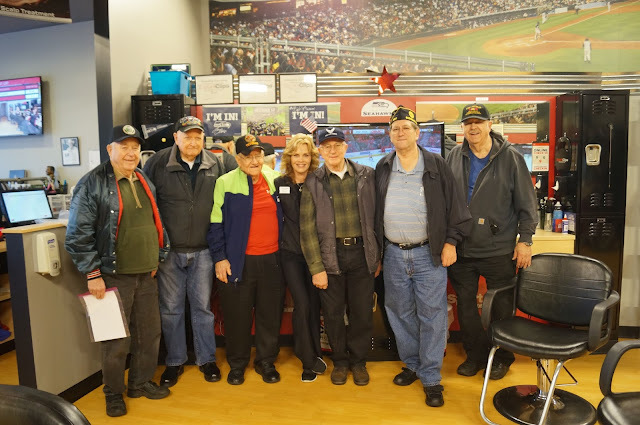 On Wednesday, January 24, 2018 members of American Legion Post 227 visited SportClips in Alderwood Plaza. There they surprised hair stylist Kari Williams with a Certificate of Appreciation and a gift card to Red Robin restaurant. 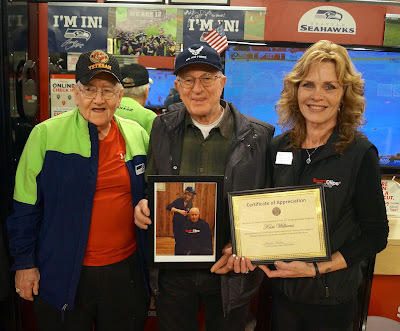 She gave free haircuts to veterans at Shoreline Post 227 on January 18, 2018. They also presented her with a picture of her cutting the hair of Larry Fischer during her visit to Post 227. Kari expressed her appreciation of Post 227's support of the business. Kari expressed a willingness to return to Post 227 and repeat the free haircuts at a later date. American Legion Starr Sutherland Jr. Post 227 is located at 14521 17th Ave NE, Shoreline 98155.